Following a vegan diet doesn't mean giving up all of your favorite dishes. These vegan pasta salad recipes are a great choice for summer pot-lucks and are both easy and delicious. This is a quick, no-fuss summer pasta salad that will keep your guests coming back for more! Serves 4. 1. Cook bow-tie pasta according to package instructions. 2. Rinse pasta with cold water until it has cooled completely. 3. 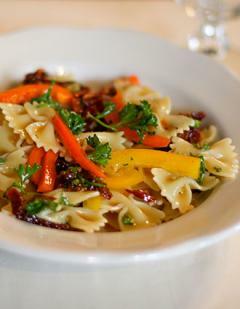 Combine pasta, bell peppers, sundried tomatoes, parsley, and Italian dressing in a large mixing bowl. 4. Place pasta salad in serving bowl, and chill in refrigerator until ready to serve. This is a unique, healthy vegan pasta salad for those with a hankering for Chinese food. Serves 4. 1. Cook fettucine pasta according to package instructions. 3. Combine peanut butter, vegetable broth, soy sauce, garlic, and red pepper flakes in a large mixing bowl. 4. Add pasta to peanut butter mixture, and toss until noodles are thoroughly coated with sauce. 5. 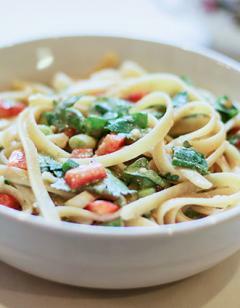 Add bell peppers, onions, and cilantro to pasta, and toss to combine. 6. Place pasta in serving bowl, and chill in refrigerator until ready to serve. This Greek pasta salad will hit the spot during your next summer picnic. Serves 4. 1. Cook penne pasta according to package instructions. 3. In a mixing bowl, combine olive oil, lemon juice, basil, black pepper, and garlic. 4. 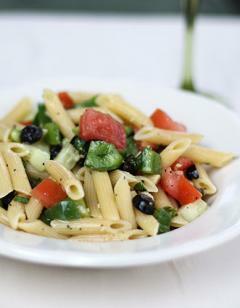 In a mixing bowl, combine cooked pasta, tomatoes, bell pepper, green onion, cucumber, and olives. 5. Carefully pour the dressing mixture over the pasta and vegetables, and toss to coat. 6. Place pasta in a serving bowl, and refrigerate until ready to serve. Whether made for kids or adults, pasta salad is always a hit. Choose fresh ingredients that pack a flavor punch for a dish that can't miss!